Huge news has come out over the last 24 hours about a MAJOR shakeup in the executive branch at Apple. 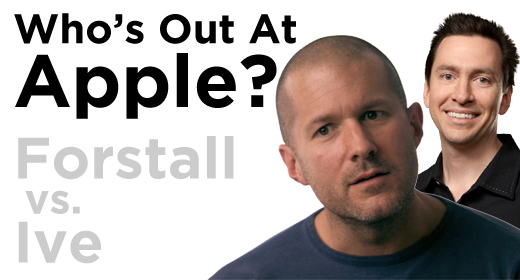 With announcements being made that Sir Jony Ive taking the leadership post over Human Interface, as well as his continued role in Industrial Design, that leaves one man out: Head of iOS Scott Forstall. This move is quite surprising for the Apple faithful; Forstall followed the same concept of design as the late Steve Jobs, which is often quite different than Ive. You can, however, see the good in this move. Craig Federighi, who has been in charge of OS X will now be in charge of both OS X and iOS, giving us a sign that those two systems will eventually be one. Federighi is exactly the right person for this job, and should be the right guy to straighten out the problems in future versions of iOS. There are many things that could be cause for Forstall’s exit, however it has been widely noted that relations between Forstall and Ive have virtually become nonexistent. According to two Apple insiders, “the relationship between Mr. Forstall and Mr. Ive had soured to a point that the two executives would not sit in the same meeting room together.” Forstall’s departure isn’t even mentioned in the Apple Press Release, however he will stick around until 2013 and work directly with Tim Cook. For a guy that has been around since the NeXT days, and basically gave life to iOS, this is a strange move by the company. Also leaving Apple is John Browett, Head of Retail. With reports of low employee morale, and several missteps, this move also isn’t surprising. So what does all this mean? We don’t really know right now. The implications aren’t very good considering the swift moves, however the long-term success of the company still looks bright.